Note: Originally published on the "Anime Archivist" blog April 2014, based on a previous version published on the "Lost World of Anime" website in 2006. During my initial years in anime fandom, especially in those early pre-internet years, one of the things I loved doing was collecting anime magazines. Most were a wealth of knowledge and data, especially for information starved fans like myself. Certainly in the early years of fandom these were an important source of news and info, especially if you were completely Japanese language deficient. As I’ve already gone through a brief history on the Japanese side of things, I thought it might be good to have a look at what happened in the west. With this series of posts, I hope to cover the majority of English language anime (and some tokusatsu) magazines that are no longer published, but it will be by no means a definitive list. Some are just too obscure (such as ones published in Singapore, Malaysia and South Africa) or were printed in such a low number that they were practically impossible to find when published, let alone years afterwards. Before I begin, I must note that I am including any publication that has been printed on proper printing press as a magazine. Though I am not including fanzines, however I am including magazines which began as fanzines/newsletters which eventually became magazines. So the first magazine on the pile is “Anime-zine”. 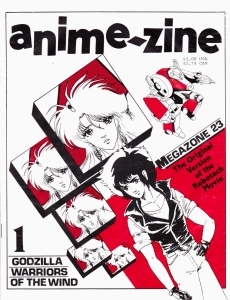 Widely considered to be the first English language anime magazine, it’s debut issue was published in April 1986. The magazine born out of the ashes of the Star Blazers Fancub. Club founder Mike Pinto was instrumental in getting the magazine up and running, though the actual core staff of the magazine were editor Robert Fenelon, co-publisher Beverly Headley and Luke Menicheli who did the layouts and graphics. While the presentation of the magazine was a little rough in spots, the debut issue was quite impressive. In its humble 28 pages it included articles on “Megazone 23”, “Nausicaä of the Valley of the Wind” and an article on the “Godzilla” films. In it’s pages you’ll also find some pretty good fan art for the period, including a Desslar “Gamilon Express Card” comic which Fenelon would later act out in cosplay at AnimeCon ’91. The second issue, released in 1987, saw the magazine expand to 44 pages and a full colour cover. 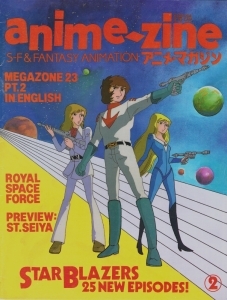 The magazine had improved substantially with articles on “Saint Seiya” and the third “Yamato” TV series, which included a detailed section on the original aborted plan to make it run for 52 episodes. The late Toren Smith (founder of Studio Proteus) also contributed with an article on “The Wings of Honeamise” that included a script comparison of Go East’s obscure and so-dreadful-it-only-played-once English dub of the film titled “Star Quest” (screened at Mann’s Chinese Theatre in February 1987, a month before the Japanese release). Also in the issue was an article on Toho’s sci-fi films of the 1950’s and 1960’s and what was meant to be a continuing column; Toren Smith’s “News From Japan”. Looking back through some of these old magazines, some of the info really of surprises the bejesus out of you. Toren Smith tells us that Harmony Gold have done a horrible English dub pilot of “Aura Battler Dunbine” and that mecha designer Yutaka Izubuchi (who would go on to direct “RahXephon” and “Yamato 2199”) told him that Lucasfilm will be providing special effects for a live action version of the series. Toren seems to swear black and blue that he saw Harmony Gold’s English dub, but that news about a live action “Dunbine” is kind of hard to swallow. But regardless of the what could described as somewhat dubious information presented as fact, these three issues are prime examples of why I usually keep these old magazines and sometimes use them as a main source for reference rather than the internet. There’s just some brilliant nuggets of information here. Apparently Viz were considering publishing Mitsuru Adachi’s “Touch” and even the “Doraemon” manga in English. Mark E Rogers’ fantasy short stories book “The Adventures of Samurai Cat” was apparently getting an animated movie adaptation by Hyperion Films (“The Brave Little Toaster”) with character designs by Go Nagai. However quotes from Rogers in a news article in the third issue have him cursing the studio who seem to have led him up in the garden path. Apparently the Go Nagai thing was a lie by the studio, and his characters were reduced to ethnic stereotypes. Unsurprisingly the film was never made. As you may have guessed, general western animation was also covered to a degree with several news items including the aborted attempt to make a sequel to the 1968 animated film “Yellow Submarine”. It was reported in two issues that the new film, titled “Strawberry Fields”, was in pre-production at the New York Institute of Technology Computer Graphics Lab, who had previously produced sequences for the “Lensman” movie. The magazine also noted that ITC Productions was putting up $6 million for the project. Apparently it was due for a summer 1988 release, but in a latter issue it was reported it had been moved to a spring 1989 timeframe. Surprisingly I cannot find information on the web about the film which is as detailed as what is in this magazine. 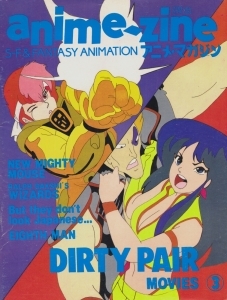 The final issue saw the magazine reach 60 pages and included articles on “Gundam: Char’s Counterattack”, The “Dirty Pair” and “Crusher Joe” franchises (with the “Dirty Pair” material taking up more than a third of the magazine), “Dragonar”, 1960’s anime “Eight Man” and a small article on musician Ryuichi Sakamoto (formerly of Yellow Magic Orchestra and composer for the film scores of “Merry Christmas Mr. Lawrence”, “The Last Emperor” and The Wings of Honneamise”). There were also articles on the works of American animator Ralph Bakshi; one on the 1980’s remake of “Mighty Mouse” and the 1977 film “Wizards”. The “Wizards” article was written by the late Jeff Thompson who would later publish Animenominous magazine in the early 1990’s and also would later become a producer at the Right Stuf. Patricia Malone of the New York chapter of the Cartoon/Fantasy Organisation also wrote an interesting article on the ethnicity of characters in anime and a column called “New Visions” which focused on new TV and OVA releases was published in place of Toren Smith’s “News From Japan”. It was promised that issue four to was to contain articles on “Zillion” and more on “Saint Seyia”, but luck was not on the magazine’s side. A post on rec.arts.anime in 1991 by Winston Sorfleet of Ianus Publications indicated that the publisher suffered a stroke and during the same period the editor had a serious car accident. Publication of the magazine halted immediately, and it never recovered from these terrible setbacks. Subscribers were given issues of Ianus Publications’ and Protoculture Addicts’ “Poster-zine” (which used many of the staff from “Anime-zine”) to make up a year’s subscription. Despite its short life and humble beginnings, it contained some great info, some of which you can’t find on the web today. Unfortunately I only discovered the magazine in a second hand bookstore in Sydney some eight years after it ceased publishing. It would have been interesting to see how the magazine may have developed had it continued, as each issue was better than the last. While it certainly wasn’t as polished as the magazines which followed it, “Anime-zine” is a great little read if you want to see what pre-US anime industry fandom looked liked. Despite the fact nearly 30 years have passed since it was first published, all three issues can be found easily on eBay.